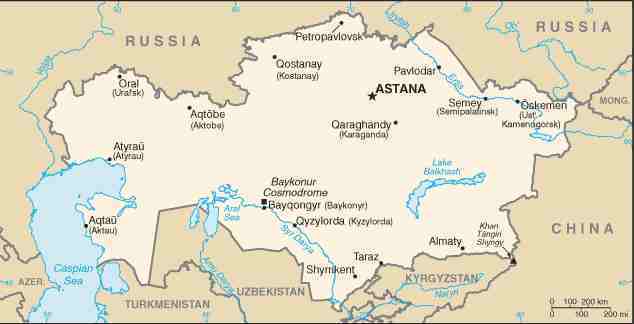 Kazakhstan, officially the Republic of Kazakhstan, is a country in Central Asia. Ranked the ninth largest country in the world, it has a territory of 2,727,300 km² (greater than Western Europe). It is bordered by Russia, Kyrgyzstan, Turkmenistan, Uzbekistan and the People's Republic of China. The country also borders on a significant part of the Caspian Sea. In terms of population, Kazakhstan ranks 62nd in the world, with a population density of less than 6 people per square kilometre (15 per sq. mi.). The total population has declined somewhat since independence, dropping from 16,464,464 in 1989 to about 15,300,000 in 2006. This is mostly due to the emigration of Russians and Volga Germans since the dissolution of the Soviet Union. Kazakhstan, once the Kazakh SSR, is now a member of the Commonwealth of Independent States. Kazakhstan has been inhabited since the Stone Age: the region's climate and terrain are best suited for nomads practicing pastoralism. Historians believe that humans first domesticated the horse in the region's vast steppes. While ancient cities Taraz (Aulie-Ata) and Hazrat-e Turkestan had long served as important way-stations along the Silk Road connecting East and West, real political consolidation only began with the Mongol invasion of the early thirteenth century AD. Under the Mongol Empire, administrative districts were established, and these eventually came under the emergent Kazakh Khanate (Ak Horde). Throughout this period traditional nomadic life and a livestock-based economy continued to dominate the steppe. In the fifteenth century, a distinct Kazakh identity began to emerge among the Turkic tribes, a process which was consolidated by the mid-16th century with the appearance of a distinctive Kazakh language, culture, and economy. Nevertheless, the region was the focus of ever-increasing disputes between the native Kazakh emirs and the neighbouring Persian-speaking peoples to the south. By the early 17th century, the Kazakh Khanate was struggling with the impact of tribal rivalries, which has effectively divided the population into the Great, Middle and Little (or Small) Hordes (jüz). Political disunion, tribal rivalries, and the diminishing importance of overland trade routes between East and West weakened the Kazakh Khanate. During the 16th and 17th centuries Kazakhs fought Oirats and Dzungars. The beginning of the 18th century marked the zenith of the Kazakh Khanate. During this period the Little Horde participated in the 1723 - 1730 war against the Dzungars, following their "Great Disaster" invasion of Kazakh territories. Under leadership Abul Khair Khan the Kazakhs won major victories over the Dzungar at the Bulanty River (1726) and at the Battle of Anrakay in 1729. This page was retrieved and condensed from (http://en.wikipedia.org/wiki/Kazakhstan) see Wikipedia, the free encyclopedia, November 2007. It really started in Beijing, trying to get our Visas.